The magnificent, historic Hillside Inn of Ephraim is open again! And it is more magnificent than ever. The new team with Diane Taillon as owner and Carrie Counihan and Carlol Schalla as marketing manager and concierge respectively, have polished up this gem and made it shine. Opened as the Hillside Hotel in 1901, this is one fabulous inn that is both historic, first class and with modern amenities. 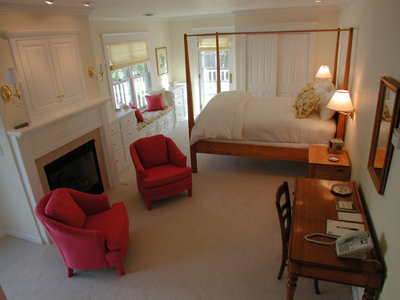 The Hillside Inn of Ephraim offers 5 unique suites that are adult only, and two separate family cottages. 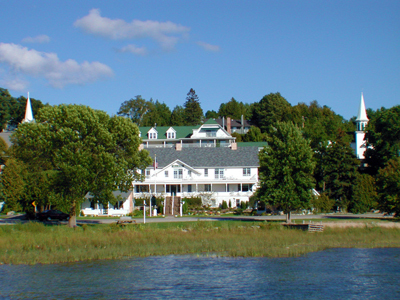 You will love that DoorCountyNavigator.com has brought this inn to your attention – because it will impress you how wonderful it is. Diane also runs Arbor Crowne Properties, a real estate agency, which has an office in the inn as well. Lots of talent, love and attention has gone into the inn. This is a wonderful inn for groups and weddings as well. Just spectacular. 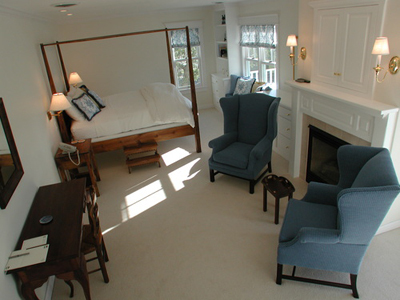 Their refurbished seasonal cottages are just right for a family or a gathering! 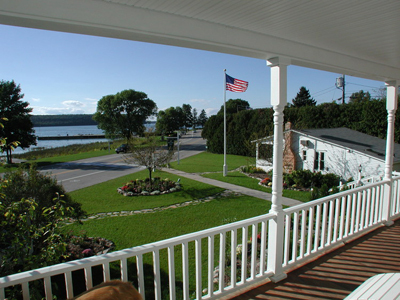 Situated in the front garden of the Inn, these charming residences bring a taste of the original Door County experience to your vacation, but with all the necessary conveniences and comforts you’d want. Both offer furnished living rooms with gas fireplaces and HD TV/DVD, three separate bedrooms that will sleep up to six, fully equipped kitchens, Heat/AC, whirlpool tubs, and spacious verandas with porch swings for leisurely enjoying shoreline views. Centrally located in the heart of Ephraim, you and your guests are just steps from ice cream at iconic Wilson’s and access to fun Eagle Harbor water activities, such as kayaking, jet skiing, paddle boarding, pontoon rental and more. Weekly or longer rentals. 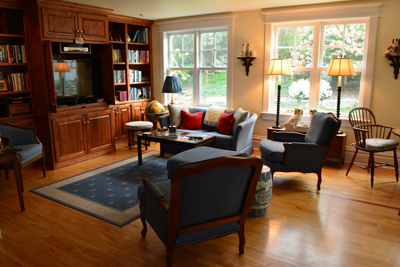 The common areas are wonderfully appointed and bring a warmth, comfort and coziness to each area. The reading and relaxing room is gorgeous and comfy. The front porch is fresh and clean with wooden chairs and small table – you can enjoy eater views, sunsets, concerts in the Harborside Park right next door in high season. A great place to unwind. Everything about this place is done to perfection. It is a unique find and we are so happy that it is open again and more glorious than ever!